I can't get any of the settings to do anything. Noscript and uBO already automatically show disabled for the page, but CS Lite shows blocking cookies. Do you have to allow cookies for the chrome page somehow? Slickone wrote: I can't get any of the settings to do anything. Noscript and uBO already automatically show disabled for the page, but CS Lite shows blocking cookies. Do you have to allow cookies for the chrome page somehow? In some cases, you have to disable NoScript in the add-ons manager to get the Forecast Fox settings to stick. Thanks. That's a big hassle. I assume people have looked into other, quicker workarounds, correct? Slickone wrote: Thanks. That's a big hassle. I assume people have looked into other, quicker workarounds, correct? You're welcome. I haven't heard of any other workaround. NoScript is a good add-on, but sometimes it can be a pain. 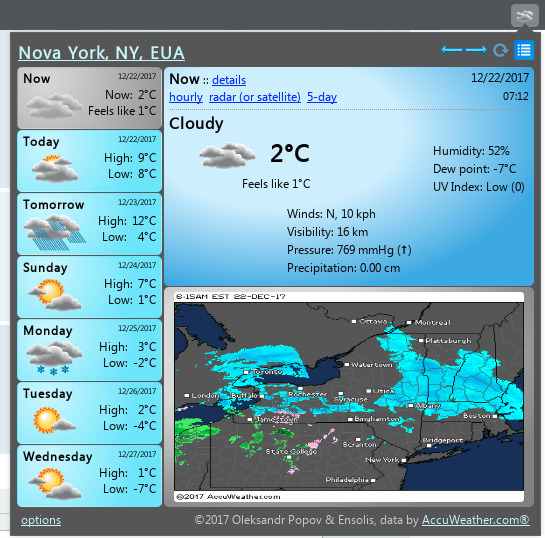 At startup, after FF starts, Forecastfox is on toolbar with blue umbrella icon. At this time FF responds to user commands. Afterwards, Forecastfox icon changes to current weather info and FF resumes respoding. Since it may be related to FF overall sluggish behaviour, I included this info in a bugreport to Mozilla as well: https://bugzilla.mozilla.org/show_bug.cgi?id=1424684#c1. Does Forecastfox make API calls that are blocking (during initialization)? andrixnet wrote: Does Forecastfox make API calls that are blocking (during initialization)? Would be good to have the Moon Phases info displayed on the pop-up window as well. what do you mean about "pop-up window"? When you install the addon you get a button to place anywhere you want! 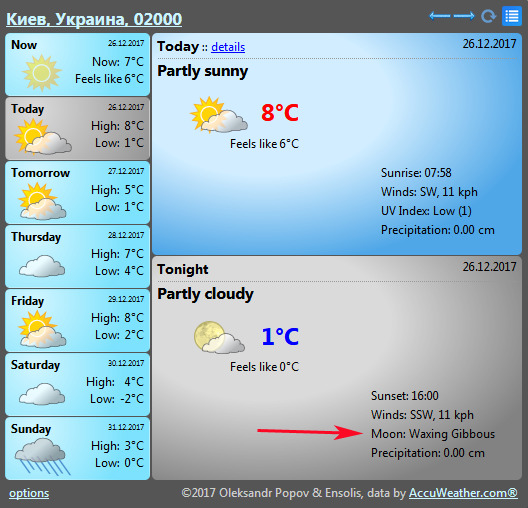 mavman wrote: Would be good to have the Moon Phases info displayed on the pop-up window as well. Ups... sorry! I missed that one!!! I tend to always have it on "Now". mavman wrote: Ups... sorry! I missed that one!!! I tend to always have it on "Now".